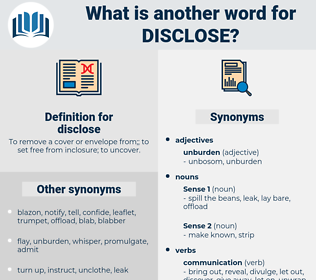 What is another word for disclose? let the cat ouf of bag. 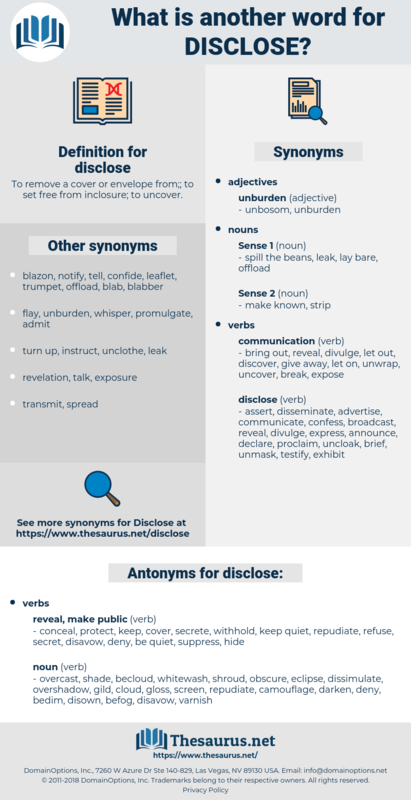 clears, launches, finds, disclosure, disclosures, states. lay, expose, publicise, publicize, uncover, publishing, announce, disclosure, demonstrate, identify, transmit, denounce, tell, advertise, furnish, distribute, testify, highlight, mention, explain, give, showcase, open, contain, reflect, clarify, unlock, promulgate, prove, popularize, outline, underline, suggest, confirm, discuss, illustrate, condemn. cover, suppress, secret, secrete, hide, withhold, refuse, keep, protect, keep quiet, conceal, be quiet. overcast, shade, becloud, whitewash, shroud, obscure, eclipse, dissimulate, overshadow, gild, cloud, gloss, screen, repudiate, camouflage, darken, deny, bedim, disown, befog, disavow, varnish. Nothing could have made him disclose the secret. He knew that the Indian and de Courcelles had entered into some conspiracy, but he believed they could guard against it, and in good time it would disclose itself. dyslexia, disclike, Dacelo Gigas, dough-like, duck-like, doxology, doglike, dogleg, dyslexic, douglas, desexualise, douglass, Deglaze, dyslogia, decalogue, desexualize, disklike, daisylike, dog sleigh, Deae Cellulose, dislike, dace-like. peach, talk, babble, let the cat out of the bag, tattle, out, confide, come out of the closet, reveal, leak, blab, muckrake, spring, sing, bewray, blab out, blackwash, babble out, come out, betray, blow, spill the beans.